Bagging a lining is fun but freaky. Midway through it you get to a stage where it looks like origami gone wrong in the worst way. And then all of a sudden you have a beautiful lined coat. Like magic. The instructions for bagging a lining in the Jackie Coat instructions are excellent. If you follow them step by step you should get a good result, but here are some extra pictures and information to help you along. By now you have attached your facings to your jacket, which also completes your collar. Now is also the stage to complete your buttonhole facings. I find it useful to read as many “bagging a lining” tutorials as I can as different pictures and explanations often help it to “click”. As well as the pattern instructions, some helpful ones I have used are the Grainline Studios Tutorial (featuring a really cute little mini jacket), this one from Pattern, Scissors, Cloth (slightly different but awesome technique), and I always find the tutorials over at Fashion Incubator excellent, and this one on bagging a lining is great. These tutorials do vary slightly from the Jackie pattern in how the hem is finished but are still very useful to read. 1. Assemble your lining pieces to make your lining “shell”, leaving a gap in the side for later turning. 2. Lay your lining right sides together to your jacket, pining all along the facing edges and matching notches. 3. Sew lining to jacket along facing edges, leaving the bottom 4″ (10cm) unsewn. You will find you have to ease your way in around the curvy parts like the collar facing, but trust your notches and it all works out perfectly. I sometimes find that it helps to start from the centre point of the back neck facing and sew down each side of the jacket in two steps which helps prevent fabric creep while sewing. A walking foot is also very useful. I use mine for nearly the entire sewing process when sewing thicker fabrics and multiple layers like you do with jackets and coats. Remember to start and end sewing 10 cm or 4″ from the bottom – you will sew this small section closed as part of finishing off the hem. 4. Sew your lining hem to your jacket hem. 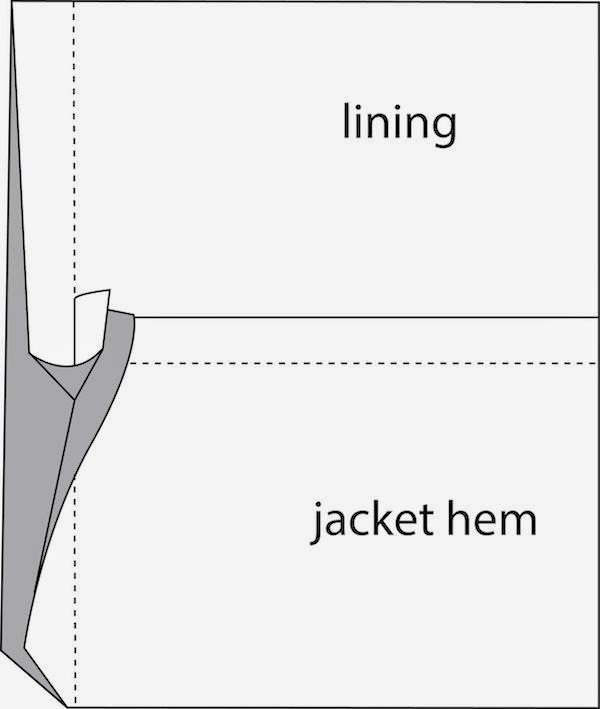 As your lining is shorter than your jacket you have to pull the lining down to reach the hem. 5. Sew your facing hem. When sewing the facing hem you must start and end at the dot (shown as the cross in my picture). Be precise. 6. Sew your “tricky corner” which is where your lining hem intersects with your facing edge. This step allows for a neat 100% machine sewn finish of that tricky corner where your hem joins your facing. It is hard to explain and the instructions really don’t make sense until you are actually doing the steps, and then at all comes together in a massive “aha” moment. You can see in my picture below, because of turn of cloth and the amount I rolled my facing seam so that it can’t be seen from the front, my facing finishes a bit further in than the pattern allows. I just trimed that excess on the jacket hem off (where you can see the diagonal blue line finish). The things to know to make it easier are. That mark on the facing hem (you can see it above in blue as a cross) is really important. When you clip to your sewing line, clip through both layers of fabric. Once you clip the next steps become much clearer. And there you have it – a lovely finish complete with pleat for movement, all done by machine. 7. Sew your sleeve lining to your jacket sleeves. This is where you make your jacket look like a turtle. Once again, this really only makes sense as you follow the instructions while actually doing the steps. You can refer to the online tutorials I mentioned above for some more illustrations to help you with this. (Grainline Studios Tutorial and the Fashion Incubator Tutorial). 8. 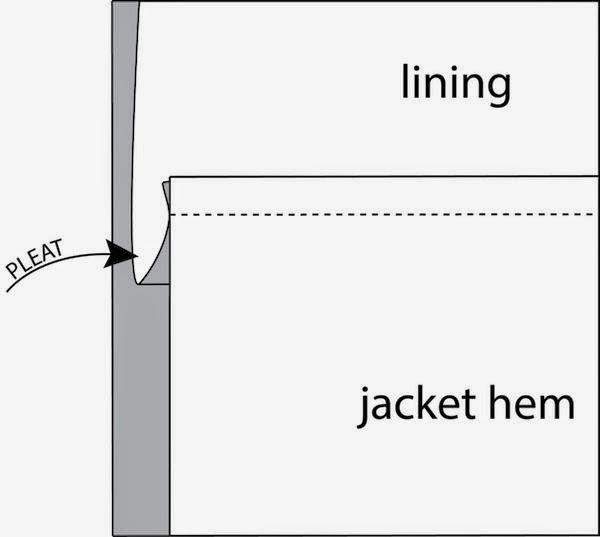 Turn your jacket right side out through the gap you left in the lining and press your hems into place. I find doing this helps me make sure everything is sitting right before I “commit”. Sometimes I unpick and redo, especially that “tricky corner” area. 9. Turn your jacket inside out again and secure your seam allowances where they meet at the hem points. You do this so your hem sits nicely and doesn’t drop down or sag. You can do this by machine or by hand (I like to do it by hand with some loose catch stitches). I find I prefer to do this after I have turned and pressed the hem and made sure it is in the right place, then I turn my jacket inside out again and secure the hem. This requires a bit of contorting but looks lovely once the jacket is right side out again. 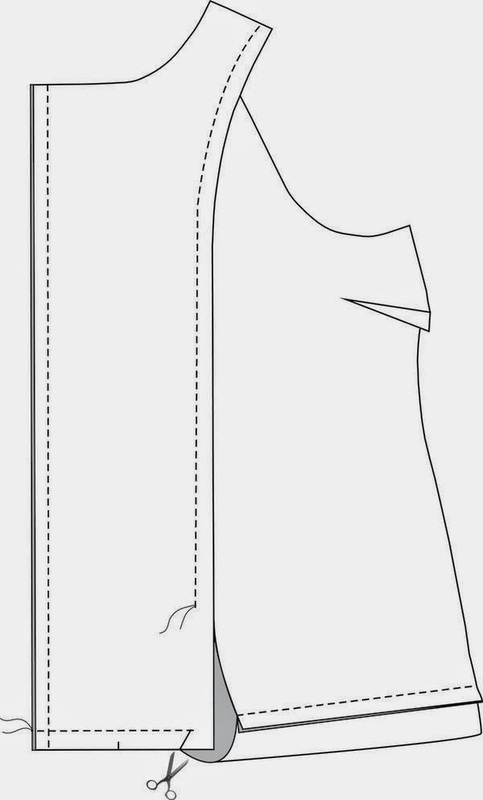 Rather than repeat all the steps again here, pop on over to the tutorial on this for some step by step pictures on how this works, but essentially you are sewing your two seam allowances together where the hem seam and jacket body intersect. Simple but very effective, plus completely invisible. A note about grading your seam allowances. Triming and grading your seam allowances really helps to give a good finish once everything is turned right side out. Here is a tutorial about seam grading from A Fashionable Stitch. I also use a trick I read about (I think it was on the Sunnygal Studio blog but darned if I can find it now) which is to pull a few threads out rather than trimming the seam down, which dramatically thins out the seam allowance of thicker fabric with no harsh ridges. It only works on straight warp or weft threads but is an easy way to grade seams. Once your seams are all graded, secured, and all is as it should be, the jacket is turned the right side out again for the final time and you slip stitch your opening in the lining. Here is a photo of my finished lining hem at the back. Any questions about this process, just leave a comment. All the posts for the sewalong can be found here.